Excel Table is probably one of the most underrated features in Excel. 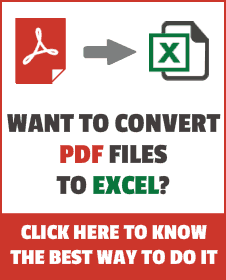 It is super easy to understand and have a lot of merits over regular tabular data in Excel. It makes it easy for a user to manage data if it is in a tabular format. Just by converting a data range into a table, you are able to use a variety of features that will make your work super easy (I cover these features in detail below in this article). Go to Home –> Format as Table. Select any one of the pre-defined formats. In the Format as Table dialogue box, ensure that the right range is selected. If your table has headers, keep the check box checked. In case your data does not have headers, excel automatically inserts headers with generic name Column 1, Column 2, and so on.. TIP: A much faster way to do this is to select any cell within the data set and use the keyboard shortcut – Control + T. It would directly open the Format as Table dialogue box. Data Filters are enabled (note the arrow pointing down at the right of the headers). Note that when you convert tabular data into an Excel table, only the design changes. Nothing happens to the data. If you want to convert the Excel Table back to the normal tabular range, right-click anywhere on the table, go to Table and select Convert to Range. 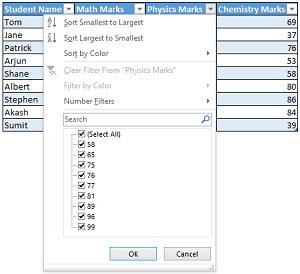 An Excel Table automatically creates headers that have the option to sort or filter. If the Excel Table is long and stretches beyond the visible screen, the headers remain at the top when you scroll down. This would work only if you have selected the table and scrolling down. If you type anything in the cells adjacent to the Excel table, it automatically expands the selection to include this data. If not required, this can be switched off. Excel Table is cool and fashionable. You can dress it the way you want. When you click on any cell within the Excel Table, an additional tab TABLE TOOLS DESIGN appears in the Excel Ribbon area. Properties: Here you can change the existing name of the Table (yes! every table gets a name and it is very useful for referencing, as you will see later in this article), or you can re-size the table. Remove Duplicates: This can be used to remove duplicates. Convert to Range: To convert an Excel Table into regular range. Insert Slicer (in Excel 2013 only): This works exactly like Pivot Table slicers, and could be helpful in filtering data using a single click. External Table Data: This section can be used to export data or refresh data. 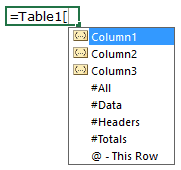 Header Row: If unchecked, it removes the header from the table. Total Row: If checked, it inserts a total row at the end. Banded Rows: If unchecked, it removes the alternate band in rows. Banded Columns: If checked, it applies alternate band in columns. First Column: If checked, it makes the first column font bold. Last Column: If checked, it makes the last column font bold. Filter Button: If unchecked, it removes the filter drop down from headers. 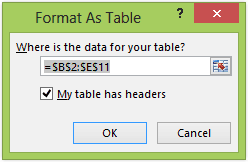 If you have given a specific name to the Excel Table, then that name would be used instead of Table1. You can refer to data using names instead of cell references. If you add more data to the table, it automatically gets figured in if you have used structured references. NOTE: Structured references do not work within conditional formatting custom formula. Using Named Ranges in Excel. 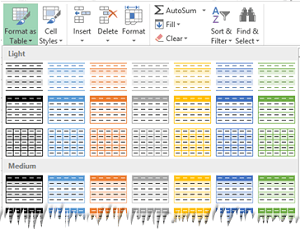 The Art of Creating An Excel Dashboard. This is helpful but i cant understand how I can add footer?